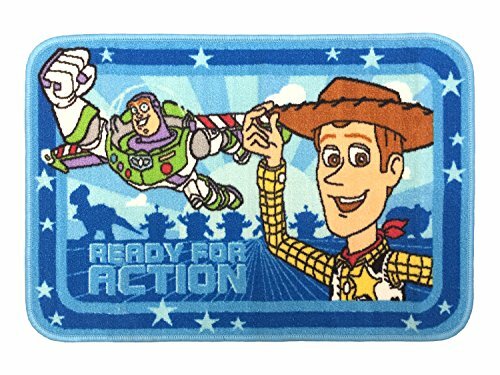 Update any child's bath space with their favorite Toy Story Buzz Light-year and Woody tufted bath rug! Put a smile on your child's face during bath time with their favorite classic Toy Story characters, Buzz and Woody. Bath rug is printed on synthetic polyester/acrylic blend fabric for long lasting durability and beauty. Slip/Skid resistant. Stitched binding provides stability and added style. Rug is enhanced with a rubber, non slip non skid backing for added safety. Synthetic fibers are naturally anti-microbial and resist mold and mildew. Easy care, machine washable polyester/acrylic construction resists fading. Rug measures 20" x 30". Imported. Manufacturer: Jay Franco and Sons, Inc. Publisher: Jay Franco and Sons, Inc. Studio: Jay Franco and Sons, Inc. If you have any questions about this product by Disney Pixar, contact us by completing and submitting the form below. If you are looking for a specif part number, please include it with your message.